"Your new social life in the Manchester and Cheshire area starts here"
Are you single over 40, live in the Greater Manchester area and would like to improve your social life and meet like-minded people? If so, then we are the group for you. Online – complete the form on the Request Further information. Cascade is a social group for single people which provides a genuinely relaxed opportunity for individuals to meet, socialise and make new friends. We believe it is important to have a network of caring friends as well as having the opportunity to meet new people. 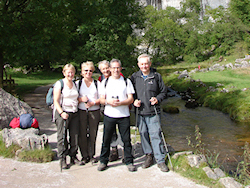 Cascade members host a number of fun, relaxing events and social activities. Our events reflect our members interests including theatre and cinema visits, day trips, weekends away, meals out, cinema and quiz nights all affording you a wonderful selection of fun social events. There is also lively discussion at our reading group, or if you prefer more active pastimes there are also regular walks and summer cycle rides in a variety of locations. Cascade Social Group can assist you in meeting single like-minded people and help you build a social life and find new friendships. Cascade Social Group for Singles in Greater Manchester is made up of interesting, active individuals who enjoy living life to the full and meeting new people from diverse backgrounds in enjoyable settings. We like to think that we are the friendliest singles group in Greater Manchester. Anyone who is single and over forty can join and contribute to our selection of appealing social events. Cascade Singles Social Group is a non-profit organisation which is run by the members for the members. If you are interested in joining Cascade Singles Social Group in Manchester, you are invited to attend up to three of the planned social events as a guest after which, we hope you will decide to become a member. As with most singles groups in Manchester our events are arranged across the Greater Manchester area and occasionally further afield, so some form of transport would be highly desirable. Take a look at our website to see our current events programme for Cascade Social Group in Manchester.